These chickens were modeled on my own chickens, Duck and Cluck. I took an online class from Anita Lehman through Carla Sonheim's website that was a very thoughtful look at composition. Sometimes it's nice to get back to basics and see how structure influences outcome. And, on a side note, it's been nice to have fresh eggs to eat and use in baked goods! I don't know why it took so long for me to go back to making collage and mixed media pieces. Maybe I didn't think they were "serious" enough, or I forgot how much fun it was for me to work this way, or maybe I just forgot how to do it. Recently, I found some fruit that I painted simply on canvas paper. I took out cheap, thin acrylics, poured green and yellow on top, and pushed the paint around the paper. After it dried, I tore out the fruit and saved them for a collage. That's where my playing around with fruit bowls began the other day. For a slight change of pace, I took a yellow piece of painted paper and turned it into a French press. I've mainly been using really smushy media, like a soft pencil, conte crayons, and Faber Castell gelatos. These collaged pieces really feel like me, and I'm loving all the color! I'm test driving some new products at the market this Saturday. It's so much fun to play with color and shape on functional bags and totes. I like the simplicity of playing with fabric, paint, and potatoes. Yes, potatoes! That's what I used to make my stamps......and, they're compostable! I decided to challenge myself with an online course, Explore Florals, taught by Victoria Johnson. It was three weeks of design briefs, each focusing on a different way to think about florals, with an accompanying palette. It was harder than I thought to get out of my own way of doing things and try something new. Just like life, I suppose. I am so thrilled to have my very first drawn illustration in the current issue of UPPERCASE Magazine! I drew this on Thanksgiving, 2017. We decided to stay home and celebrate, just the three of us. I wanted my daughter to feel like that even though we weren't going anywhere, it was going to be a special day. So, I let her pick the drinks! I'm trying to remember this and to boldly learn new things without getting bogged down by self doubt. It's hard! I'm trying to enjoy the quiet stillness of winter. We've had lots of snow (and snow days) and rain, which has made for long weeks of nasty weather. I'm drawing daily and I can see myself steadily improving. Winter is not my favorite season. It's cold, it's dark, it's icy....but with those restrictions comes permission to quiet your mind, think, make. It's the season when I have the most time. My daughter is in preschool, and farmers' markets are few and far between. It allows me to focus on my art and on all the other little projects that I think about during the summer. This year I'm stretching and taking Make Art That Sells, an online course from art agent Lilla Rogers. So far, I feel out of my element, which I'm taking as a good sign. Growth comes in fits and starts, and it isn't always comfortable. I'm getting ready for the upcoming holiday season! I'll be at the Bennington Farmers' Market on the first and third Saturdays of Nov. and Dec., and I'll be at the Williamstown Berkshire Grown Markets on Nov. 19th and Dec. 17th. I'll have lots of lovely linen aprons and tea towels, and delicious edibles, perfect for gift giving or enjoying with your family and friends. See you soon! I’m not one of those people who arranges their closet by color or their books alphabetically by title, but there is definitely an, ahem, endearing (?) quality of obsession in my personality. It rears its ugly head most frequently in the realm of food. Beyond my all-encompassing love of all things edible, there lies an intense urge to delve into one ingredient, technique, or skill to the abandonment of all else. Citrus is my current problem. Upon lugging a vast amount of citrus home from the store, I realized that it was a lot of fruit for two people. I required ideas and recipes and probably even jars for preserving. Gradually, I thought of uses. Two jars of preserved lemons, incorporating one of the fresh Meyers that I brought back from CA. 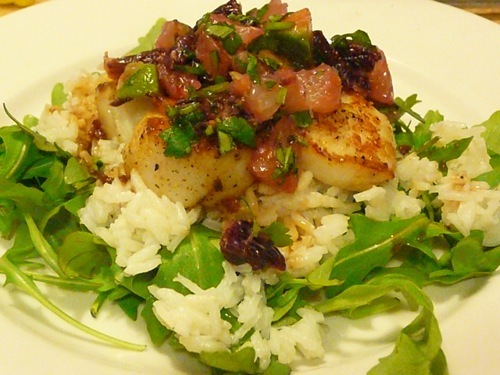 A citrus-inspired feast using scallops as the guest of honor. A couple of snacks for me. Four huge jars of grapefruit marmalade for future baking projects and toast. And I’m currently down to two lemons, one of which I’ll use in a roast chicken, lots of clementines which are the perfect lunch snack for me and my husband, one blood orange, and a manageable amount of grapefruits (which I eat in the evenings). In addition, my compost pile is reveling in its new citric additions, which will lead to healthy, Vitamin C-rich produce this summer. ©2019 Paper Cake Scissors. All Rights Reserved. Site Map.